We receive lots of questions about the Beachside Dash, so we’ve attempted to answer all of them below. Keep reading to learn more about our Registration FAQs, our Event FAQs and our On-the-day FAQs. There is also more information on our Beachside Dash page. No, the Beachside Dash offers something for everyone – for all ages and all abilities. You can run, jog or walk in any, or all of the three distances: 10km, 5km and 2km. Can I enter a team? The Dash is open to both teams and individuals. You can “create a team” or “join a team” during the registration process. Team Captains can also invite members to join their team via their Team Page. So, gather your friends, family and colleagues to enter as a team. Can I involve my company in the Dash? Absolutely. We are always looking to involve the community and business supporters. So, if you’re interested in getting involved in the 2018 Beachside Dash, click here to read about all the Sponsorship opportunities available. We feature our sponsors in lots of different ways and customize it to match your business – we’re happy to have a conversation about your needs. How much does the Dash cost? You can also register on the day – but you’ll need to line up, and bring cash. It’s also more expensive. So, we encourage all Dashers to register online. When do online registrations close? You can register online until 11.59pm Thursday 6th September, with early bird entries closing at midnight 31st July. Registrations are available on the day at Peter Depena Reserve, Dolls Point, for all Dash categories. Please note that we only accept cash on the day. We encourage all Dashers to register online in order to avoid queues and receive your bib with the least amount of fuss. 10km Dash on the day registrations are open from 6.45am to 7.20am. 5km Dash on the day registrations are open from 7.20am to 8.50am. 2km Dash on the day registrations are open from at 8.50am to 10am. Why should I make a donation if I’ve paid my entry fee? Entry fees for the Dash only cover the costs of hosting the event. The St. George Beachside DASH raises money for research at St George & Sutherland Hospitals. In 2018, 284 people in the Bayside, Georges River and Sutherland Shire LGA’s will be told they have bowel cancer. Bowel cancer is the second most common cancer in Australia and it has the second highest death rate. Researchers at St George Hospital are working on the microbiome and how the bugs in your gut contribute to the development of bowel cancer. This is just one of our important research programs that really needs your support. Peer to peer fundraising is available for anyone who wishes to ask friends, family and colleagues to get behind them and make a donation towards medical research. Your fundraising page will be created when you complete your registration. Click here to read some of our fundraising tips and get started today. Are all the Dash distances timed? Yes, every Dash entrant receives a bib and a time chip. So, if you want to run all three distances – for example – you will need three bibs and three chips. We ask that every child under 12 in the 2km event has an accompanying parent registered. There is not cost for the parent however it allows us to allocate a bib to the parent. Anyone who attempts to enter the Dash without a bib will be escorted from the event. Full results will be posted on the Beachside Dash Facebook page and on the Dash website on Sunday 9th September, after 4pm, with a link emailed to all participants after the event. Are there prizes for the winners of each distance? Prizes will be awarded in 10km & 5km for 1st, 2nd and 3rd place, male and female, and in the 2km prizes will be awarded for 1st, 2nd and 3rd place in kids age categories 12 and under. Presentations for each Dash event will occur once the following race has commenced. For the 2km Dash presentation, this will be at approximately 10.45am. YES! We are excited to announce that we are introducing participation medals for all finishers in every event! Will I receive a certificate of achievement? Once again, we are please to be able to offer all of our participants a certificate of achievement. Once the results have been posted online, simply search for your bib number or name, click and download your certificate. Full results will be posted on the Beachside Dash Facebook page and on the Dash website on Sunday 9th September, with a link emailed to all participants after the day. Can I view the map of each course online? In 2018, the 10km, 5km & 2km events will remain on the same course as the past few years, which allows runners and walkers to stay on the foot path for the entire race (which makes it ideal for setting a personal best time). The only exception is the beginning of the course, which starts on grass. The course follows the beautiful beachside path from Peter Depena Reserve in Dolls Point, to Kyeemagh and back. All courses will be signposted, with marshals positioned along each course to assist with the shared paths (please note the course is not private or enclosed). Water will be available along the 10km and 5km course, as well as at the finish line. Photos and videos will be taken throughout the day, mainly at the start and finish line area with thanks to our official Dash photographer. We’ll put up a photo gallery on the Dash Facebook page – so make sure you Like it. Also, we would love to see your photos! Use the hashtag #runforresearch. Any images taken by SSMRF staff, Board Members, Volunteers, Marshals, Sponsors, and the official Dash Photographer on the day may be used for future marketing material and on social media sites. If you have any concerns please contact SSMRF to discuss. You can view photos form the 2017 St.George Bank Beachside Dash here! Can I transfer my entry or do you offer refunds? Unfortunately, entries are non-transferable. No refunds will be given for any cancellations. Contact SSMRF for more details. Is parking available on the day? On-street parking is available in the surrounding streets of Peter Depena Reserve. Please be mindful that this is a residential area and the event starts early on a Sunday morning. The nearest train station is Kogarah or Rockdale. For more information on public transport options call the Transport Info line on 131 500 or visit www.131500.com.au. When does my distance start? 10km Dash commences at 7.30am. 5km Dash commences at 9.00am. 2km Dash commences at 10.10am. However, all Dash logistics are subject to change – so please register online to receive all the email updates regarding the day of the event – please make sure you check your junk box the week leading up to the event. When can I collect my bib? All bibs must be collected on the day. When you arrive at Peter Depena Park, head to the Registration area and look for the signs to guide you to bib collection. 10km Dash – 6.50am to 7.20am. 5km Dash – 7.20am to 8.50am. 2km Dash – 8.50am to 10am. The start and finish line will be in Peter Depena Reserve, Dolls Point (off Russell Ave). On the day registration also takes place in the same location, along with the presentations and all Dash activities from our sponsors. Prams are permitted in tall distances. We ask that all joggers, walkers and parents with prams to please start at the back of the field. Is there a place to leave my valuables? There is a free bag drop zone next to the registration desk. This will be available for participants only. Your bib number will be attached to your bag. Bag drop will be open from 7am to 11am on the event day. Please note: This area will be supervised at all times, however, the organizers take no responsibility for lost or stolen items. 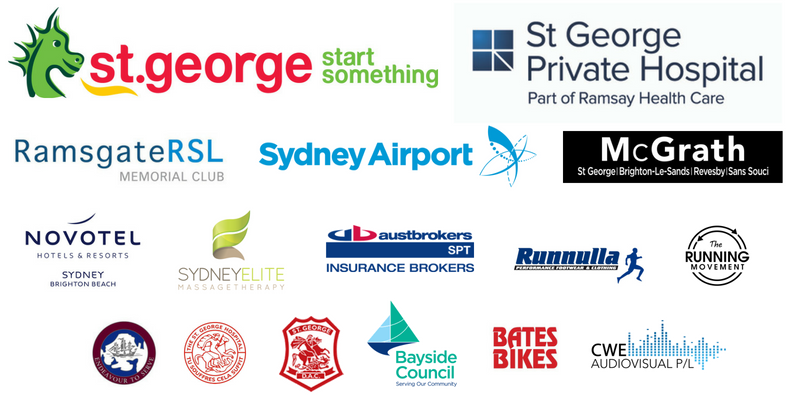 With thanks to our major sponsors, St George Private Hospital will be on hand at the start/finish line and along the course for any first aid requirements. Please signal a course marshal if you require assistance. Will there be any race warm ups offered on the day? Yes, our fantastic friends The Running Movement be conducting race warm ups for each event – 10km, 5km and 2km. Not only will they be warming you up for the race they will be there to welcome you home with custom post race stretches and cool down exercises. Visit them near the finish line to discover the best post race recovery for you. Will food be available on the day? SSMRF will host a BBQ in Peter Depena Reserve thanks to our friends at Novotel Sydney Brighton Beach on the morning of the Dash, with 100% of the proceeds going towards life-saving and life-improving research in our local hospitals. Please bring cash to purchase food on the day, with $5 buying you a sausage sandwich & drink or bacon egg sandwich & drink. Additional drinks can be purchased for $2. Can I set up my own BBQ? SSMRF has exclusive access to Peter Depena Reserve, and has secured Council permission to host the Dash. So, we cannot accommodate any additional BBQs or stalls. If you’re keen to join the celebrations at the finish line or promote your business, please contact SSMRF. Where can I find the toilets? There are toilets located in Peter Depena Reserve, and some limited locations along with 10km and 5km courses. Yes, we encourage you to slip, slop and slap – sunscreen will be available at registration desk should you forget. Of course! We encourage you to bring family and friends down to cheer you on, and support you as you cross the finish line! Do you have any last advice? Click here to enter your team in the St.George Bank Beachside Dash today!